If you recall laptop history, you know that one pillar of laptop technology is communications. That means not only computer communications, networking, and modem use but also people communications. Yes, it’s possible to use your laptop as a phone. The go-to app on your Windows 10 laptop for chatting it up is Skype. You can connect with other Skype users to text-chat, voice-chat, and video-chat. If you already have a Skype account — great! Otherwise, you can use your Microsoft account to sign in. The Skype app dwells on the All Apps list. Click the Start button, and then All Apps, and then locate the Skype app. If you don’t see it, look for the Get Skype app, which installs Skype. After the Skype app starts, sign in or create an account. Work through the setup. Eventually, you see the main screen. To place a Skype call to a Skype contact, choose the contact. They must be online and available. After they connect, you can text-chat or bring it up a notch and activate voice- and video-chat. 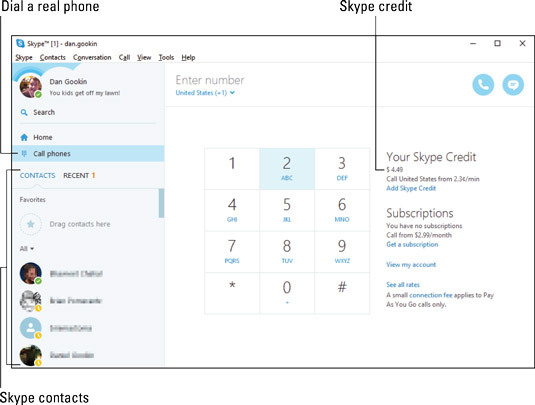 You can call a real phone with Skype only when you have Skype credit. You can see the Skype credit, which is a paltry $4.49. Even so, that’s enough to chat for several minutes — even internationally. Use the dialpad to type the number and connect. When you’re done using Skype, you can set it aside or sign out. If you set aside Skype, it stays active and catches incoming chats or video call requests. Simply close the app window to set it aside. Click the App button on the taskbar to reactivate Skype, or choose the notification for an incoming message. To sign out of Skype, click the Skype menu item and choose Sign Out. You hear the “Skype deflating” audio play, and then the sign-in screen appears. You’re officially signed out of Skype and can close the app window. Click the Add Skype Credit link to add more credit to your account. If you don’t want to spend the money for Skype Credit, ensure that your pals have Skype on their computers, phones, or tablets. Then you can chat it up for free as long as an Internet connection is available. Though you can use inflight Wi-Fi to access the Internet, most airlines forbid you to use Skype while aloft. When the other party receives a Skype call, they see an unusual or unknown phone number appear on the caller ID. Therefore, it’s a good idea to send them an email or otherwise alert them to the incoming call. Get a good headset if you plan on using Skype for video chat or phone calls. Yes, it does work with the laptop’s built-in microphone, but a headset is so much better. Plus, a headset doesn’t annoy everyone else in the room.